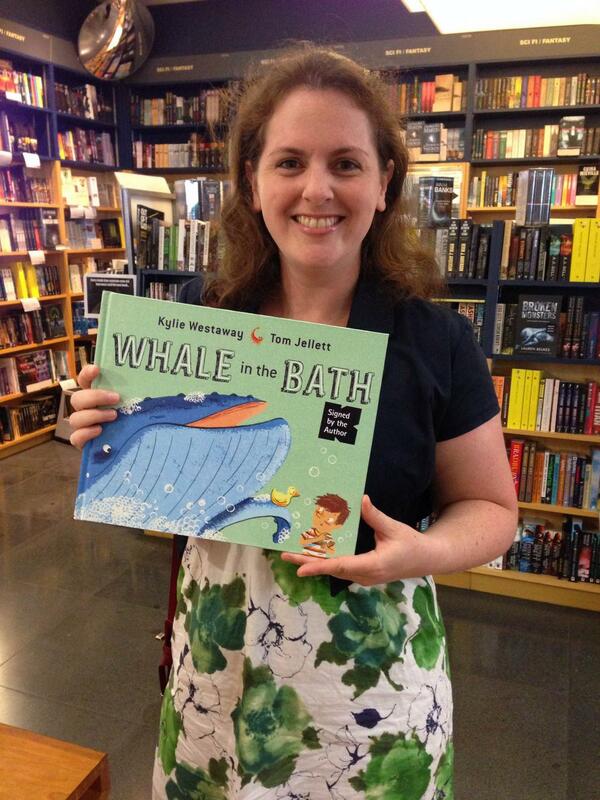 Recently Kylie Westaway published her first picture book, Whale in the Bath, illustrated by the wonderful Tom Jellett. Here she offers up some tips on getting published as a picture book author. I was three when I first announced that I wanted to be an author. I have no memory of what led me to this decision, beyond an early love of books. I knew a lot of people who finished high school and weren’t sure what they wanted to do next, but I never wavered – although I did go through a few phases of “marine biologist AND an author”, “dolphin trainer AND an author”, “queen of Egypt AND an author”. 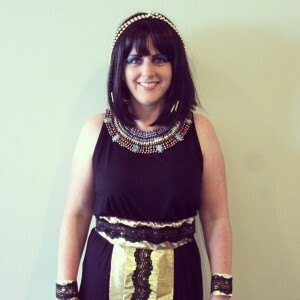 Kylie as an Egyptian Queen, and now an author! The people who didn’t know what they wanted to do used to tell me how lucky I was to be so certain. I don’t disagree. I wouldn’t trade my love of writing for anything (except on the days when it drives me nuts). But it created a great deal of pressure. What would I do if I couldn’t fulfil this dream? How soul-shattering would it be if the one thing I had always wanted to do remained impossibly out of reach? Being an unpublished writer is like being part of a hydra on steroids. For every writer who gets published, 50 more spring up in their place. And getting published can often feel like a Herculean task – a feat so difficult it sometimes seems impossible. I definitely don’t have all the answers, but I thought I would share some of the more useful nuggets of wisdom that came my way during the process of getting my first book published. As many people as possible, of all different ages. I was ridiculously lucky when it came to submitting my manuscript to a publisher because I had a children’s book publisher ask to see some of my work. Taking advantage of this once-in-a-lifetime opportunity and wanting to maximise my chances, I decided to send two stories. The first, the one I was most confident about, was the product of two solid years of rewrites and editing. The second was one I had written 5 years previously, in a single draft. I dusted it off, reread it, and decided the idea was sound but the writing was rubbish. I rewrote it in half an hour, sent both stories off, and crossed my fingers, toes, and everything else. You’ve probably guessed the outcome – the second story was the one that succeeded, and the story that has become my first published book, Whale in the Bath. I thought that I must have overworked the first story, rewritten it to the point where the spark originality and freshness was lost. But when I actually got up the courage, some months later, to ask my publisher what she had thought of the first story, and why it hadn’t been selected for publication, she said that it was because she didn’t really like picture books that had such an overt message. I was puzzled: what was the overt message? It was because it was all about recycling, she said. My publisher had nothing against recycling, but that wasn’t the point. At no time had I ever considered my story to be about recycling. If it had a message at all, it was about being comfortable within yourself (original, I know). Getting other people to read your manuscript doesn’t just help to iron out kinks and spot plot flaws or instances where you’ve changed the character’s name halfway through. Particularly with picture books, get your readers to tell you what they think your story is about. Ask them what they would say if they were writing the blurb for the back of the book, or describing it to someone else. If everyone comes out with something different, then your story isn’t clear. Whale in the Bath, for me, is about sticking to your guns when you know you’re telling the truth, but a number of people have told me that it’s about how some kids don’t like taking baths. This doesn’t take away from the story and there’s nothing wrong with your story having multiple messages as long as they’re not getting confused. Everyone reads stories differently and gets different messages from them depending on their own background, thoughts, and personal experiences, and hearing these opinions will always help you to fine-tune and improve your story. Being part of a writer’s group is a big part of what helps me to be a better writer, and I cannot recommend writer’s groups highly enough. Having a supportive group of people who give me honest and critical feedback is essential, and I would be lost without them. This seemed to me to be the essence of what my publisher had thought of my two submissions. One was a fun story that made her smile. One came across as yet another story about someone who’s different and that’s ok, with the added moral of recycling added to it. I firmly believe that the morals kids learn about right and wrong come in part from the messages they receive in books. Certainly books are excellent tools for reinforcing and demonstrating the differences between good and bad behaviour through the characters and situations they portray. The challenge for a writer is how to do this without reusing a tired formula, in a fun story that leaps off the page. What is the moral in Where is the Green Sheep? What message do we get from The Very Hungry Caterpillar? You can argue that these books contain learning tools about colours, counting, days of the week and so on, and that’s true, but they are also fun, original stories that draw children in. My 4 year old niece’s current favourite book is about a girl who goes on a sleepover and realises at bedtime that she has forgotten to bring her favourite toy, and doesn’t know how to sleep without it. There is a lesson about sharing and growing up in there, but it’s camouflaged in a story that she can empathise with and relate to. Look for the situations that children can relate to, look for fun and drama that is on their level, without talking down to them. I cannot draw. 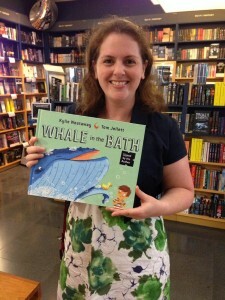 One question that I get asked all the time is whether I knew Tom Jellett (who illustrated Whale in the Bath) before he illustrated my book and whether I told him what I wanted him to draw for each page. The first time I met Tom was after the book was published. Tom received my manuscript and created the story that he saw from the words. When I received the first set of rough illustrations, I was amazed at how many pictures were exactly as I’d imagined them, and delighted with how many pictures were completely different. Tom created gorgeous visual storylines, that wouldn’t have been there if I’d been able to illustrate the book myself. It became a richer and better story with Tom’s imagination added. Picture books are expensive to publish. They are full colour, often hardback, and the market is highly competitive. Because of this, the majority of publishers don’t publish anywhere near as many picture books per year as they do novels, and often their programme is full more than a year in advance. It’s fairly standard for the majority of publishers to only publish a couple of picture books every month. But don’t give up! Keep writing, keep submitting your stories to publishers, keep getting other people to read your work. 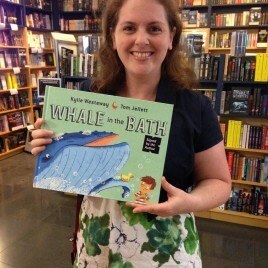 Kylie with Whale in the Bath at Kinokuniya in Sydney. Find out what sort of books publishers publish before sending your manuscript to them. Don’t send your manuscript to a publisher who only publishes adult books, for example. Don’t send your manuscript to a publisher who doesn’t accept unsolicited work (Allen & Unwin accept manuscripts every Friday, with their Friday Pitch, but not picture book submissions). Keep working on your own online profile. Join the CBCA, SCBWI, ASA and network with other writers and illustrators. Have a website, Facebook page, Twitter feed, and make sure you keep them up to date. And most importantly, write! If writing is your dream, then keep going. It may require a Herculean effort, but the reward is your own form of immortality. Kylie Westaway has a background in theatre, has spent a year teaching 2-6 year olds in South Korea and started working in publishing when she returned to Australia. She is a performed playwright and has written for magazines - Whale in the Bath is her first book.